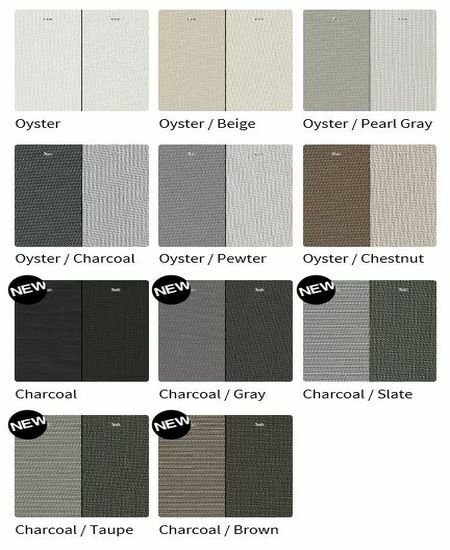 Styles 2701, 2703, 2705 and 2710 are woven from a unique teill pattern that displaces the individual yarns to create a two-sided fabric for maximum performance in heat reduction, glare reduction and improved visibility. Style 2701/2703/2705/2710 can also be used in exterior roller shades. Widths: 63 " & 98"
Standard Widths: 63" 98 and 126"
Fire Classification: California U.S. Title 19 (small scale), NFPA 701-1999 TM#1 (small scale), NFPA 101 (Class A Rating), UBC (Class I), British Standard 5867, NFPA 701 TM#2 Large Scale.